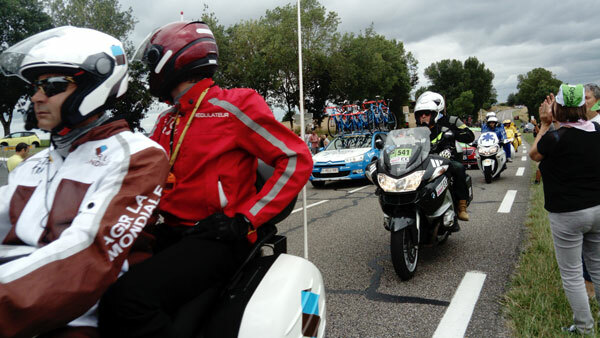 We got back from Italy on Tuesday – but more about that later…..
One of the reasons we came home on Tuesday is that all of the roads would be closed on Wednesday because the Tour de France was passing by. It wasn’t going by our house as we live on a small, dead-end lane. It was going by the entrance to our small, dead-end lane. Our lane goes past the trees on the left. There is another road that goes on this side of the trees to our village. People started lining the roads, grabbing their spots, leaving their cars where-ever around 10:00. The cars were parked all the way up both lanes. Some had chairs, some had picnics, most had coolers. 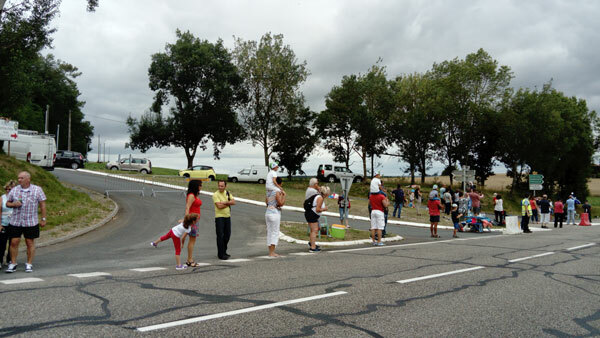 The gendarmes were walking around making sure that we all stayed behind the lines when it was important. 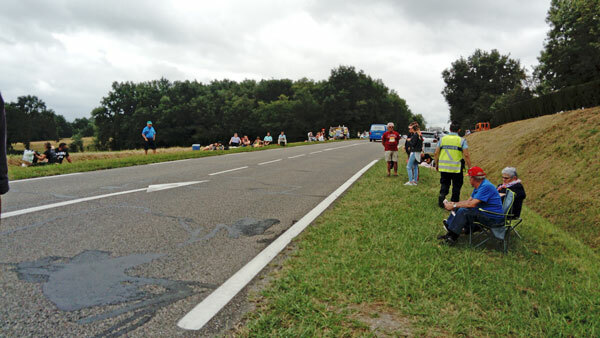 There is a ‘caravan’ that passes by about 2 hours before the riders, throwing out stuff to the bystanders – key chains, candy, caps, etc.. I missed that….. Although I heard it when I was in the shower. Following the caravan was an intermittent parade of support vehicles. And the press and the photographers and the ambulances….. 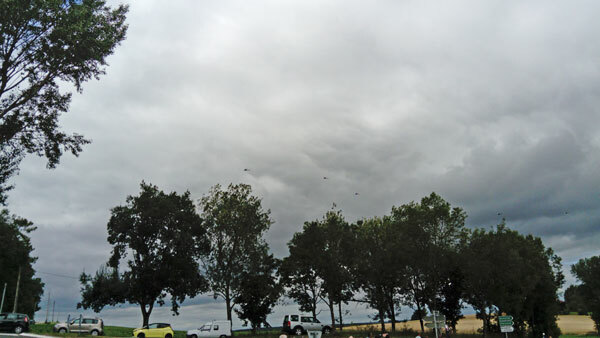 There were 5 small helicopters (look for dots in the sky) and one big one that circled while the riders approached and went by. All of the above entertained us for two hours. 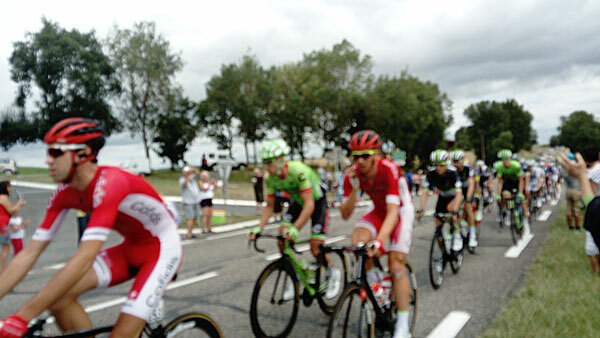 Then the riders came by – which took about a minute. Could have been the speed…. I was standing very close to the white lines at the start. After almost losing my toes I stepped back a few feet. They’re very fast and very focused. 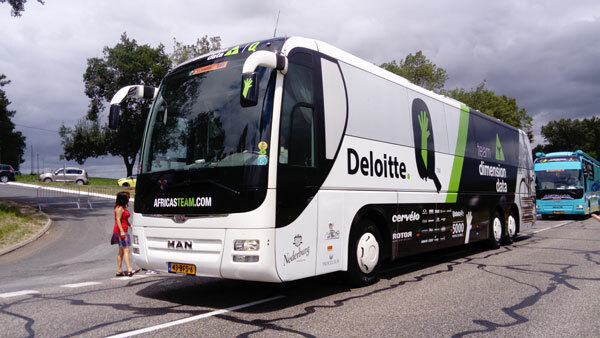 After the riders we had the parade of support buses. All of the drivers of all of the vehicles honked and waved. 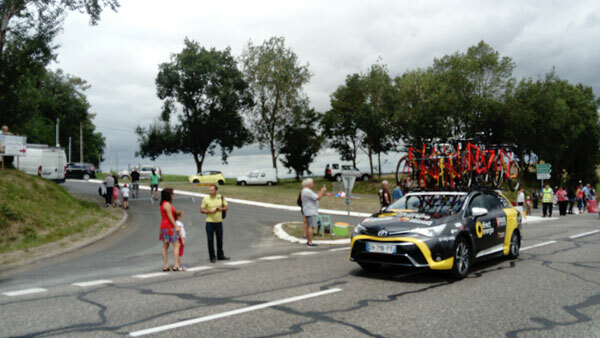 After they left us they had another 190 kilometers to travel before the day’s finish in Pau. 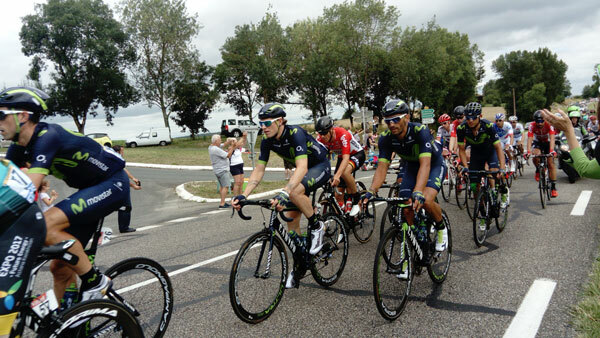 Today they were in the Pyrenees – probably a little more exciting than our flat farmland. Naturally, we went to an ‘After Tour’ party and picnic which took care of the rest of the day. Maybe tomorrow I can finish unpacking and do some landry….. 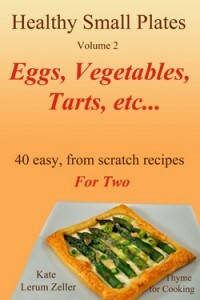 Hours to prepare – a meal, La Tour – gone in a flash! It’s huge isn’t it ???? Such an institution !!! And now you have Bastille Day !!! Excuse me for commenting so late. How very very cool. Even if it was only about a minute that you saw actual riders. They sure ride fast, don’t they? Tanna – exactly! But exciting…. Elizabeth, it was cool – and yes they do. And so very, very close together!